ESF's first Public Speaking Lab (PSL) opened this spring to assist students with presentation and communication skills. Located in 13-B Moon Library, the free resource allows students to reserve a private space to practice and record any type of presentation. "I think in STEM (science, technology, engineering and mathematics) fields, writing is absolutely important and so are speaking abilities," said Betsy Hogan, the PSL coordinator. "It's not that STEM students lack the skills, it's that these skills have become extremely important in our economy and culture and they require practice." Hogan, a lecturer for the environmental writing program, said the lab fills a need for ESF students. "If you're on campus all day, there's really nowhere to practice," she said. "It's hard for most college students to have privacy to try new things." 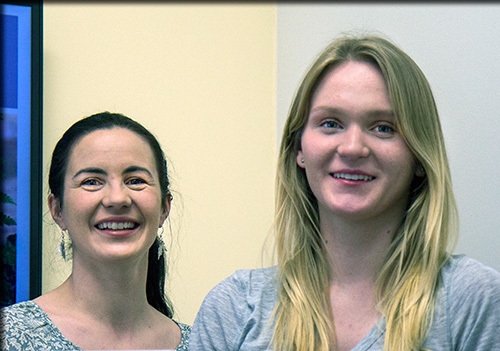 Three student interns who are pursuing the environmental writing and rhetoric minor in the Department of Environmental Studies are available for consultations through an online appointment system or during their lab hours. "It's different when your friends give you feedback or if you just record it yourself," said Kasia Szczurek, one of the interns. "It's someone who's going to critically look at your presentation." Students also have the option of practicing alone by checking out the lab key for up to two hours at a time from the circulation desk in Moon Library, much the way they would check out a book on reserve. Students can also send presentation files or their recordings to the interns via email to receive virtual feedback. In addition to their work in the PSL, the interns do other projects, such as speaking with local high school students about public presentation skills and assisting with related on-campus workshops. Szczurek wrote an informational pamphlet with presentation tips and methods for the students participating in ESF's Spotlight Symposium, which was held April 15 and 16 in the Gateway Center. The symposium showcased undergraduate and graduate research and outreach posters. Szczurek interviewed several professors from different disciplines to compile input about what is required for a good oral presentation. Hogan feels there will be more demand for the lab as major events, such as the Spotlight Symposium or final presentations, get closer. "We know a great number of students are going to need to use these skills," she said. Amber Unruh, a senior majoring in environmental science, first used the PSL as part of her capstone course. The students are required to give 15-minute presentations on their capstone projects, which mainly consist of research and internship opportunities. After their first experience, she and two peers decided to regularly use the lab to rehearse and improve. "All three of us got such great feedback from each other that our presentations were much better the next week," said Unruh. "I would definitely recommend the PSL to someone, even if they think they're generally a good public speaker." Szczurek emphasized the importance of practice and preparation. "If you practice, that's going to make it a lot easier, even if it's just in the room alone or in front of one person," she said. She sees the PSL as an invaluable resource, saying, "[Students] have no other way of really watching [themselves] in the same perspective." Unruh agrees, "I think it was valuable for me to present my presentation multiple times to my peers and review the content of my presentation. Being able to let down your barriers and let your peers judge you helps you for your final presentation." Unruh feels they have all gotten better with practice at going slower and focusing less on informational content and more on audience engagement. They focused on critiquing overall speaking abilities, hand movements and body language as well as PowerPoint explanation and crisp explanations. "Going in there even for a couple minutes trying to do something really showed me what I needed to work on," said Unruh. Her research focuses on the termination of a chemical compound in mice biological samples, so she found she needed to more concisely explain the topic for the audience. Szczurek is now considering graduate school and understands that presenting her future research will require public speaking beyond what has already been required at ESF. "I'm majoring in biology and I didn't realize public speaking was going to be such a big component in my school career," she said. Hogan is currently working with Laura McArdle, the internship coordinator from Career Services, to see how the PSL can be used to help students prepare for job interviews, meetings and other opportunities that might arise in their career searches. Given the anxiety most people experience over public speaking, Hogan said the resource addresses a common problem. "I feel like this was a no-brainer," she said. "Once we looked into it, we just thought this was something our student body would really benefit from."